5 Whys is a root cause analysis tool for helping teams quickly get to causes of an issue before developing solutions. It’s a great team-builder because the group buys-in to the *real* problems as they surface during the process. To help the team understand all the causal factors that have a bearing on an issue / problem (i.e. fix the real problem rather than treating the symptoms). When you have a problem — it’s a simple diagnostic tool to explore an ‘intractable’ issue. Always use before developing a solution — that way you avoid slipping into ‘fix-it’ mode and addressing symptoms rather than causes. Always go through a root cause analysis phase of difficult problems — otherwise solutions may be short-lived and unsustainable. Don’t debate each point to death. Identify issues and move onto the next as quickly as possible. It’s important to complete it so you can see the whole picture before drawing conclusions. A large square piece of blank paper big enough for everyone to stand around and see comfortably (1m high by 3m long is normally enough). Marker pen for the facilitator (at least one with some spares if required). No tables and chairs – this is a standing high-energy exercise. Keeps the process on track and avoids getting stuck talking at length about issues. Ensures all notes made on the tree are unpacked, clear and understood by not only the participants but people outside the process so it can be used later. Stays positive throughout (lots of issues will be uncovered). The Facilitator starts the analysis with a concise statement of the challenge you are facing — in this example the challenge is: “Revenue budgets not balanced”. The Facilitator captures the answers to the question as short, succinct phrases rather than single words. For example, rather than ‘Costs’ or ‘Income’, unpack these topics by describing the causes in a succinct phrase, such as ‘Cost are too high’ and ‘Income is too low’. Gradually work across, from left to right, as you pose the same question “Why?” at each successive level of your analysis. 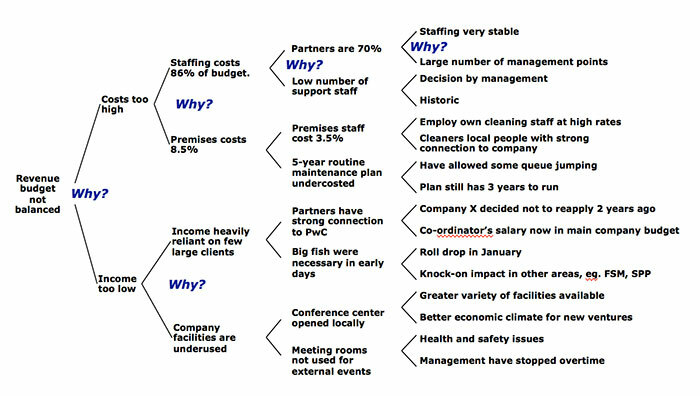 In this example I have worked the staff cost issues through four levels of analysis. Try to work a branch of your analysis to five levels or until you reach a ‘root’ cause — whichever comes first — before returning to a higher level and analysing another branch of the issue. The completed analysis identifies all the ‘root’ causes that must be taken into account in your solution to the issue. When deciding how best to capture the answer, it is good practice to check whether someone not involved in the analysis could nonetheless follow the logic of the analysis by reading your output afterwards. Note: For illustrative purposes in this example I have identified just two causes at each level. In your analysis there may well be more than two answers to “Why?” at each level. You might not be able to solve all the root causes you identify, but don’t worry, having the insights from your analysis will ensure that your solution will be better informed and more embracing. Requested Slides 3 times now and still have not received anything. Is there something wrong. 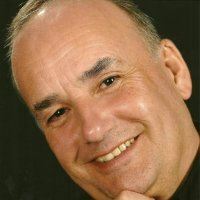 Hi there Ken … I can see you received and opened the slides so glad you found them ok.